Are you looking for a free lightweight alternative to Microsoft Word and Open Office? Are you sick of endless loading times and office programs that occupy hundreds of megabytes of space on your hard drive? AbiWord may be worth a closer look if you answered those questions with yes. What's so different about AbiWord that I would recommend to use it? There are several reasons: first it is only about five megabytes in size which is a good prerequisite for a fast loading application. 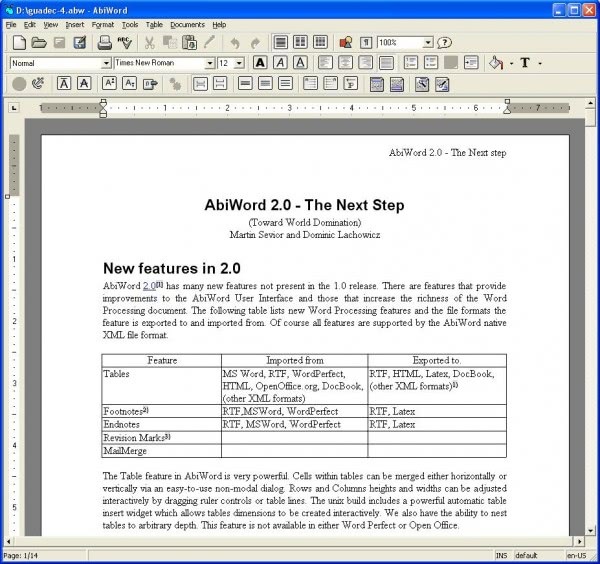 AbiWord is open source and available on many platforms including Microsoft Windows, Linux, Mac Os, FreeBSD and others. The open source tool supports all important formats like Microsoft Word, Open Office, Word Perfect, Rich Text, web documents and more. This is ideal if you want to import files from different sources and work with them. Plugins enhance the functionality tremendously, there are currently more than 50 free plugins and tools available as additional downloads from the AbiWord website. The majority of plugins add support for additional file formats or applications, like abilities to import pdf or html documents into the program. A second group of plugins falls into the tools category. Plugins in this category add features like dictionaries or translations to the program which users can then make use of directly from within the program interface. You can install a selection of those optional tools during installation. Included are for instance a grammar checker, web dictionary, equation editor or Wikipedia search integration. If you do not want those components installed, simply uncheck them during installation or select minimal from the installation presets. The program interface looks a bit dated, but looks can deceive, and if you prefer speed and performance over a beautiful interface, you may still prefer to use AbiWord over comparable solutions. Update: Abiword does not support Microsoft's new Office document formats out of the box. You need to install the correct plugin to add support. Make sure you select Microsoft Office Open XML during setup, and if you want to add Open Document formats as well, select the format as well. You can change the interface language in the program options. It is set to the local system language by default. You need to run the installer again if you want to add missing plugins to the program. Note that this will uninstall the program first in the process. Abiword supports the scripting languages Perl, Python and Shell. You may need to install the appropriate plugins though to use scripting functionality in the document editor. I started to use Abiword latelly since I’m working in a low end PC with Xubuntu (Ubuntu distro for low end machines) and I’m loving it! It even has ortography corrector for Brazilian Portuguese!